County cricketers’ benefits are not as frequent as they once were. The reward for, customarily, ten years service simply does not come around as often as it once did. Playing careers are shorter and, for those other than the very best, not as attractive as they once were. There was a time when a second benefit was not unusual. I don’t suppose Paul Collingwood will be the last to get one, but they are going to become rarer and rarer. Back in 1935 Andrew Sandham of Surrey was granted a second benefit. He was 44 and had made his debut for the county twenty-four years earlier. He was to play on for three more summers, and already had 101 of the 107 centuries he was to score during his career. Sandham spent years opening the batting with Sir Jack Hobbs for Surrey, and a couple of times for England, but the emergence of Herbert Sutcliffe prevented him playing more than 14 Tests. His main claim to fame was, in his final Test appearance, being the first man to score a Test match triple century, in Kingston, Jamaica in 1930. Before the Second World War benefit brochures, certainly of the sort that increasingly came into fashion from then on, were rare. Sandham’s was not the first, but there were few in the inter-war period, and of those there were it is probably fair to say that Sandham’s was one of the more ambitious, and the most like the sort of publication that had become commonplace by the 1970s. 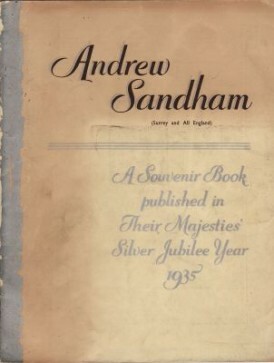 One reason why Sandham’s brochure is interesting is because in the 80 or so years since it appeared there has never been a biography of him nor any autobiography. This is despite his living to be 91 and having played for one of the ‘big six’ of county cricket. There are some clues in the brochure as to why that is the case. In common with all such brochures there is some advertising present, seven pages in total. The game has changed much since 1935, but not to the extent that advertising has. There is a particularly interesting one for Gradidge Bats. That for Lanson champagne is remarkable for its simplicity, and that for the Royal Albion Hotel in Brighton certainly brought a smile to my face. The clues that I mention come in the editor’s introduction. Early on he writes Andrew Sandham could not be called a spectacular personality, and a couple of paragraphs later adds it is difficult to write about Sandy. So that there can be no doubt on the point he does, however, confirm that Sandham was renowned as a rattling good chap, a darned good sort, and a thoroughly likeable man. Following on there are a couple of pages contributed by Sandham himself before three appreciations, from former skipper and the Surrey President ‘Shrimp’ Leveson-Gower, Sandham’s long-time captain Percy Fender and, naturally, Hobbs himself. Another man who never actively courted controversy, the most interesting story ‘The Master’ could come up with was about an occasion in 1926 when the players booked into a hotel in Taunton and Sandham gave Hobbs his room. The back story was that Hobbs was stuck on 99 First Class hundreds and had been for a while. His lucky number, for some reason he chooses not to share, was 37 and that was the room Sandham had been allocated. The clearly considerate teammate and opening partner decided that spending the night in that room might bring Hobbs luck. It was a prescient move, as the elusive century of centuries came the next day. After the appreciations come the career statistics before a few more advertisements and a space for autographs, an area which in my copy, sadly, remains empty. It would be interesting to know whether the costs of printing this very nicely produced brochure enabled the benefit fund to return a surplus, although the fact that it was a good few years before anything of quite so high a quality was attempted again suggests perhaps not. Either way it is a delightful if slightly fragile piece of memorabilia that would grace any collection. It is not a common item, but does crop up in dealers’ lists and auction catalogues from time to time – a good copy should be obtainable for less than £100.